It's that time of year again. The flowers are in bloom, the air is warming up, and people are going outside again. Time to open those windows and do some spring cleaning. But why has this become "a thing"? Some researchers trace the origin of spring cleaning to the Iranian Nowruz, the Persian new year, which falls on the first day of spring. Iranians continue the practice of khaneh tekani (Persian: literally "shaking the house") just before the Persian new year. Everything in the house is thoroughly cleaned, from the drapes to the furniture. Another possibility has been suggested that the origins of spring cleaning date back to the ancient Jewish practice of thoroughly cleansing the home in anticipation of the springtime festival of Passover (Pesach). In remembrance of the Israelites' hasty flight from Egypt following their captivity there, during the week-long observance of the Passover holiday, there are strict prohibitions against eating or drinking anything which may have been leavened or fermented with yeast (Exodus 12:15, 19). Jews are not only supposed to refrain from leavened foodstuffs (chametz), they are expressly commanded to rid their homes of even small remnants of chametz for the length of the holiday (Exodus 12:15). Therefore, observant Jews conduct a thorough "spring cleaning" of the house, followed by a traditional hunt for chametz crumbs (bedikat chametz) by candlelight on the evening before the holiday begins. Traditionally, the Catholic church thoroughly cleans the church altar and everything associated with it on Maundy Thursday, the day before Good Friday, in the Spring. Spring cleaning persists today in Greece, and other Orthodox nations. 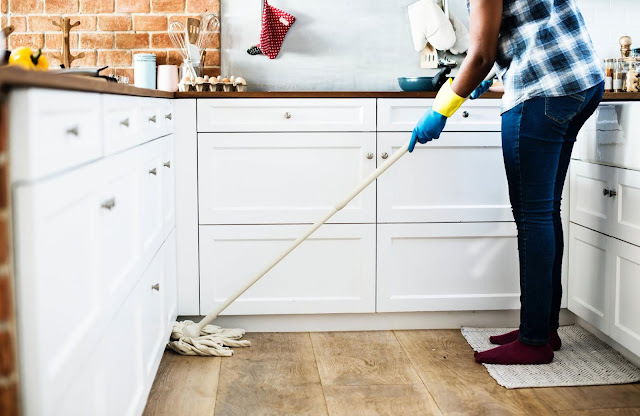 It is traditional to clean the house thoroughly either right before or during the first week of Great Lent, which is referred to as Clean Week. This also often corresponds with the Julian New Year, or April 1. In North America and northern Europe, the custom found an especially practical value due to those regions' continental and wet climates. During the 19th century in America, prior to the advent of the vacuum cleaner, March was often the best time for dusting because it was getting warm enough to open windows and doors (but not warm enough for insects to be a problem), and the high winds could carry the dust out of the house. This time of year is also when coal furnaces wouldn't run and you could wash all the soot from the walls and furniture left by the furnace. For the same reason, modern rural households often use the month of March for cleaning projects involving the use of chemical products which generate fumes. So there you have it, it's a multi-cultural thing humans have done for a long time. If you need help keeping your home or office clean we are available to assist. We offer professional maid services to the greater Los Angeles area including Santa Monica, Beverly Hills, Studio City, Burbank and more. Visit our homepage below to view testimonials from our satisfied customers.